Donald Friend first visited Bali in 1966, later deciding to settle there at Sanur Beach where he built his Batujimbar Estate. 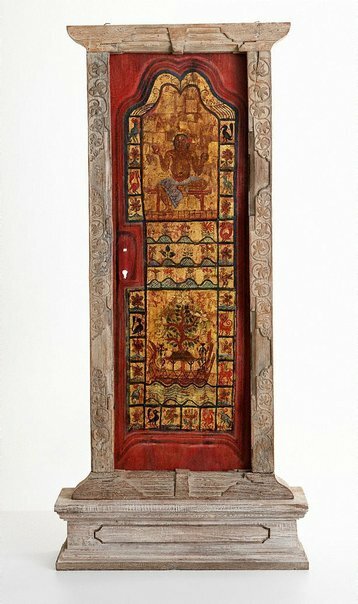 Painted and carved respectively by Friend and Balinese sculptor I Made Jojol, this door was situated either in the museum or the guest pavilion that Friend created. In the upper section Friend has created a mocking portrait of himself as a Balinese prince, sitting in the lalita asana yoga pose; while the lower part was inspired by traditional Indonesian motifs. Reflecting his great love and appreciation of Bali, Friend commissioned the young Jojol to carve the verso of this work. The subject presumably relates to a legend connected with his mountain village. A princely figure in a doorway holds his palms together in the Balinese gesture of respect; contrasting with the surrounding riot of animals and foliage in a whimsical, asymmetric composition. 0 - Whole; 203 x 93.8 x 25 cm; Door overall, including frame and plinth/base. 0 - Whole; 158.5 x 51.8 cm; Sight dimensions of painted door panel. 0 - Whole; 165.5 x 55 cm; Door panel with carving. b - plinth/base; 24.5 x 93.8 x 25 cm; Plinth/Base overall. a - door; 178.5 x 83.5 x 10.7 cm; Door overall. Art Gallery of New South Wales annual report 2006 , 'Year in review: Australian art', pg. 20-22, Sydney, 2006, 20, 21 (colour illus.). Foundation Newsletter #7 , 'Camille Pissarro preview Fundraising Dinner', Sydney, Dec 2005, (colour illus.). Australian artists in Bali: 1930s to now , Langwarrin, 2015, 33 (colour illus. ), 65. Rodney James, Australian artists in Bali: 1930s to now , 'The first and second wave 1930-1990', pg. 8-38, Langwarrin, 2015, 16, 33 (colour illus. ), 65. Beyond Bawa: Modern mastersworks of monsoon Asia , '7. Bali interlude', pg. 73-84, London, 2007, 84 (colour illus. ).